I really just don't understand why a lot of colored treated naturals get so offended by this? I chose not to color my natural strands. i had bad experiences in my relaxed days I had trouble with dyes,bleaches. It not natural hair if you alter the hair with chemicals plain and simple. It's just science it dosent make you less than another woman with natural color hair. I think women tend to get hung up on the " natural" term. If they have color in there curly hair they are now not "team natural"..it's really silly and disturbing no wonder some people view this as a cult. 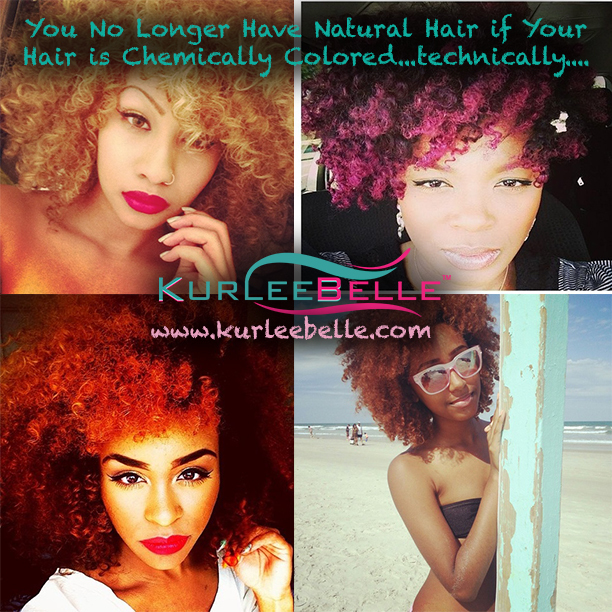 Why can't some women see that if you color your hair it's not in its natural state? Because there not deemed fit or take offense there not all of sudden not Natural. They may be natural but there hair isn't anymore I guess it's a shock and they all of a sudden think us natural without color are looking down on them..this saddens my heart. I hope one day women of color can just learn to get along and not compare ourselves to each other. My natural hair is highlighted. Does that mean only parts of my head are natural? How silly. This is the new age brown paper bag test, I guess. I don't understand why women of color are CONSISTENTLY trying to be divisive. If you don't put chemicals in your hair to straighten it, you are natural. The end. So if I use a natural hair dye to color my natural hair what does that keep me natural? The folks with colored locs, are they no longer natural? Presently, the color I have on my hair has grown out so that it is only on the ends. So are the tips of my hair no-longer natural while the rest of it is? Ladies if you have decided to go natural or have been natural all of your life, please continue to make your own decisions when it comes to your hair. If you feel that coloring your hair will somehow how make you un-natural, then please don't do it. Being that the color did not alter the texture of the hair growing from my scalp, I'm going to continue to color it whether they believe its natural or not. That is all.